What’s currently on your bedside table? Books, pictures, fresh flowers? Whatever it is, make it pretty and inspiring. Here are a few pics round-up from my pinterest board, Abode, to get your creative wheels spinning. 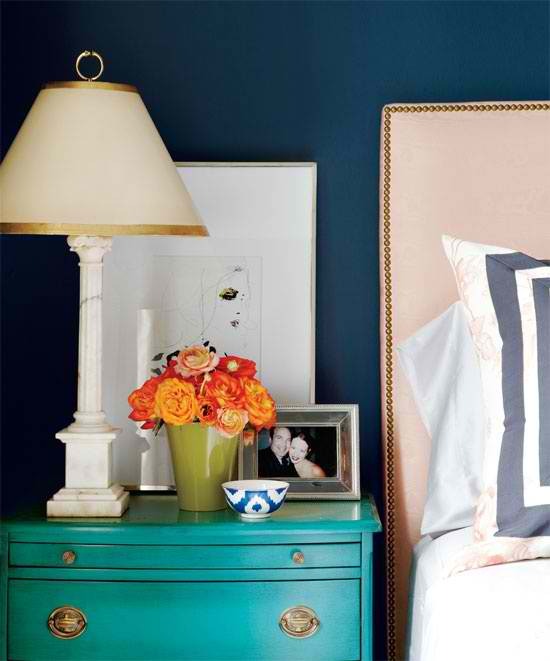 Love the look of this bedside table- peonies, books, and a tea cup. image here. A beside table made from stacking 2 LV suitcases. Currently on my to get wish list. Orange roses on top of a turquoise drawer. Love the pop of colors. Another bedside table made from suitcases and a framed mirror as the tabletop. CLEVER! And here’s what’s currently on our bedside table. To see how I made the silk decorative pillows, click here. 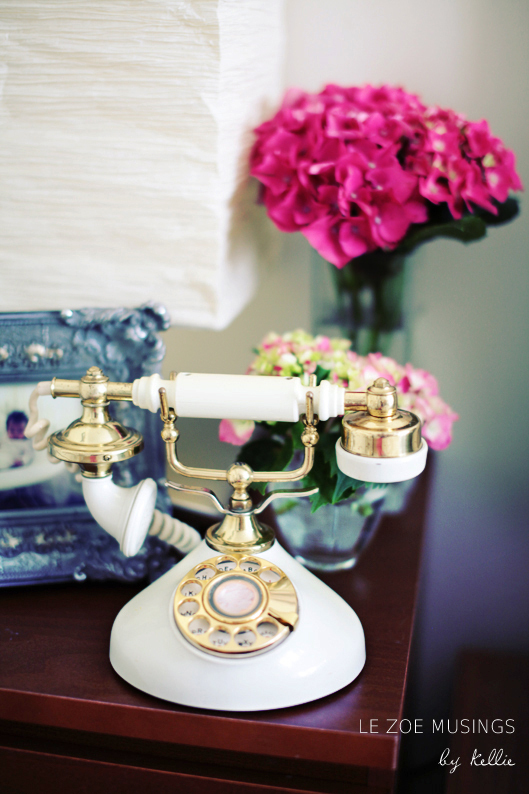 How much do you LOVE my new vintage French rotary phone?! Nope, we don’t have a land line. Who does anymore except for my parents?! It’s purely for eye candy purposes. What do you usually have on your bedside table? Please share! 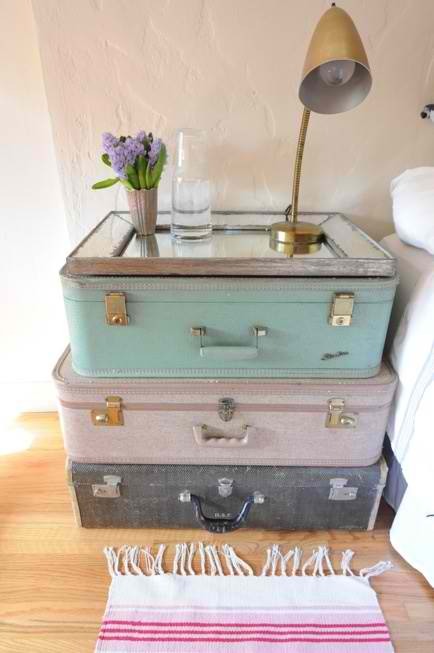 I’ve always loved the idea of stacking vintage luggage as a side table. My bedside table has 2 stuffed animals (one teddy bear + scooby doo, to be exact…my son is a year old,) a picture of Lord Ganesh, a black hair-tie, and The Happiness Project by Gretchen Rubin. Perhaps not ideal or picture perfect, but all stuff I reach for. I would KILL for some LV suitcases or trunks. They are just so awesome. My bedside table is full of books, but not really in an interseting, stylistic way. Must work on that! Love the ideas! This inspires me to update ours, we’re still using our temporary solutions for bedside tables after moving almost a year ago! Loving the suitcases with the mirror top! I have some suitcases that need to be reworked into our new decor-this could work really well!! Thanks for the inspiration. CDs, stapled. A little lamp that doesn’t work anymore. A bigger lamp that does work. A clock radio. A beautiful little box. A beautiful little paper bag that was used to pack a beautiful pair of earrings. 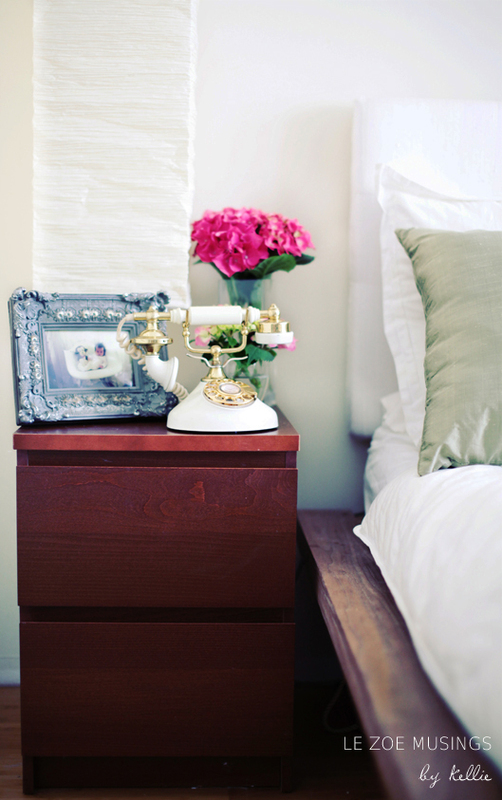 Love the suitcase bedside table. Thanks for the inspiration. :-). Our bedside tables could use some updates. They consist of jewelry boxes, lamps, candle holders and frames, none of which I’m crazy about. Looking forward to a redo soon. I think I need to tidy up a bit. Seven books are in a mountainous pile. Four books are neatly piled holding up my mirror. Several bottles of various lotions and potions. A non-flamable candle. A small sketch/painting. A recipe ripped out of a magazine. A brass knucle knife. Oh a and a lamp. My bedside table is the end part of a 22 foot wrap around u shapped desk. I have tons of books and loads of crafts that have nowhere else to live, thank goodness my son just built a small bookcase that will go on top of this desk in one corner. I should be putting books on it right now. Those are gorgeous photos. Mine bedside table looks nothing like that. It’s a mess. Bottles of lotion, hair ties, books, occasionally you’ll find an empty cup, perhaps some condoms, and in the middle of the mess is my trusty lamp. ha. I like the suitcase idea. I’ll do that day. Very nice pins…love the LV nightstand! i had a tray with beauty products on my bedside table until I saw this post. I promptly ditched the tray and now I’m figuring out which vase and flowers to replace the tray. thanks for the inspiration! Love the turquoise and the suitcases! As for mine, books, more books, perfume and my jewelry box.